The Government of Turkey has prioritized integrating its more than 3.5 million registered Syrian refugees into Turkish society. How successful have they been in incorporating the refugees into the population? CSDE Trainee Neal Marquez presented research that addresses this question at the fall CSDE Lightning Talks and Poster Session, and received the award for best poster. He will also present this novel work in the Social Media and Population Processes Session at the PAA annual meeting this April and at the Data 4 Refugees (D4R) Challenge Workshop in Istanbul. Neal and his collaborators, who include CSDE Affiliates Emilio Zagheni and Ott Toomet, utilized cell phone call detail record data from the Data 4 Refugees (D4R) Challenge as a novel way to estimate segregation in the usage of land space and the ways in which daily activities are segregated. These measures are more appropriate and less difficult to measure than traditional measures of residential segregation in the context of a rapidly shifting population. Neal also leverages digital Trace Data from the social media platform Twitter to measure sentiment toward refugees. They found that the probability that refugees contact non-refugees is greater in areas with more favorable tweets about refugees. They also found that refugees become more isolated over time and space where the sentiment is frequently negative. Neal’s successful proposal to work with these data allowed him to spend last summer at the Max Planck Institute for Demographic Research as a Guest Researcher, working alongside Emilio Zagheni who is Director of the Institute, and demographers from across the globe. The Institute invites both graduate students and post-docs to apply for positions to work at this internationally renowned demographic institute. Neal received an MPH at UW in Health Metrics and Evaluation. He is working toward a PhD in Sociology under the supervision of his advisor, CSDE Affiliate Adrian Raftery, and committee members, CSDE Affiliates Jonathan Wakefield and Emilio Zagheni. His dissertation will expand the current set of methodology used to estimate population processes in terms of both statistical methodologies and data sources. 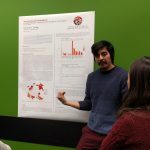 In addition to his work with D4R, he is deriving a novel data likelihood function for evaluating spatial child mortality risk surfaces that is able to account for data collection processes that report at different levels of spatial aggregation. The goal of this work is to expand on both what we see as “demographic data” to estimate population processes, as well as how we incorporate statistical methodologies to accurately report on the uncertainty of the estimates. Neal and Jon Wakefield are applying this approach to data from the Dominican Republic. In addition to this rich research agenda, Neal has already published more than six papers; most of them focus on mortality and health for the Global Burden of Disease Study.